If you are bilingual with fluency or near-fluency in English, Language Line is a company you may want to check out. 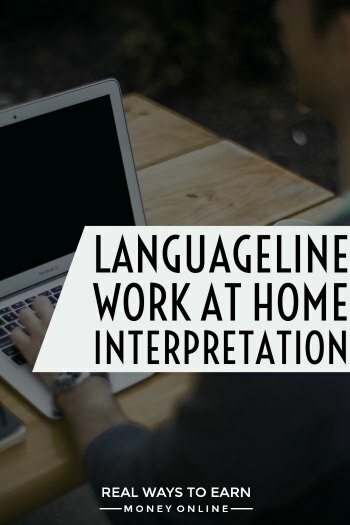 You can work at home as a Language Line interpreter, helping to break through the language barrier between two people on the phone trying to communicate with one another that do not speak the same language. This is phone work and every call you take is a three way call. You simply listen to the person who does not speak English and then relay what they are saying in English to the person on the other end of the line. There is no selling involved here and all calls are inbound. How much does Language Line pay? Language Line doesn't list the pay rate on their website and explain that the exact amount will vary per person depending on the type of job, their skills, experience, etc. However, I did some digging on Glassdoor and found that most interpretation workers at Language Line report being paid between $10 and $12 hourly. How often does Language Line pay? Their FAQ states that some people are paid weekly while others are paid bi-weekly or even monthly. Payments are made via direct deposit, but if that won't work for you, you can request a mailed check in the US or Canada. You are paid either hourly or by talk minute depending on whether or not a lot of calls are coming through. Is Language Line open worldwide? Language Line hires people to work from home in the United States, Canada, Mexico, Puerto Rico or the United Kingdom. People who live in Costa Rica, Panama and the Dominican Republic can also become interpreters for Language Line, but they are required to work onsite in one of their global centers. What types of calls do you take? You might be doing interpretation for 911 calls, banking, insurance questions, reservations, and all kinds of other things. Language Line has a number of different clients in various industries. Is a phone line required? Yes, you do have to have a dedicated land line to work for this company. Cell phones, Voip, etc. are not acceptable. However, unlike many other companies, Language Line will reimburse you the cost of putting a land line in as well as cover your monthly phone bill. Are you an IC or an employee? Most Language Line interpreters are hired as employees although some people do work as IC's on temporary projects. If your position works remotely, the company will provide you with a lap top computer with data base access, a printer, blackberry, cell phone, office supplies and other materials. If your position works at the corporate office, all of your equipment and supply needs are provided by the company. What about scheduling and training? There is some contradictory information on scheduling … I read in one section of their site that they offer a very flexible opportunity because they operate 24/7. However, in another area of their site is says their normal business hours are 8-5. Training is done entirely over the phone and you are paid for it. The total training time might last anywhere from two to four weeks. I checked GlassDoor and also WAHM.com for some feedback on Language Line. The WAHM info is mostly old threads, but I did see quite a few comments from people saying they are a good, professional company to work for. The GlassDoor reviews also vary with unfortunately more people being dissatisfied than satisfied. Primarily people complain about the demanding hours, what they consider to be low pay, and lack of communication from management. If you'd like to apply to work for Language Line, you can view their current opportunities here. I would also recommend reading through their interpretation FAQ which explains more about how it all works. Good luck!